This weekend the Universe handed me a free, working sewing machine. Technically I found it in someone's garbage... but hey I'm a dumpster diver! Where do you think I got my fully functioning Keurig K cup brewer? hehe. I love trash! So I spent the majority of Saturday night on Pinterest looking for some cool beginner sewing tutorials, or tutes, and created a new Sewing Projects Pin Board. YAY! The first thing I attempted to create was this Cute Summery Scarf from The Pursuit of Happiness Blog. 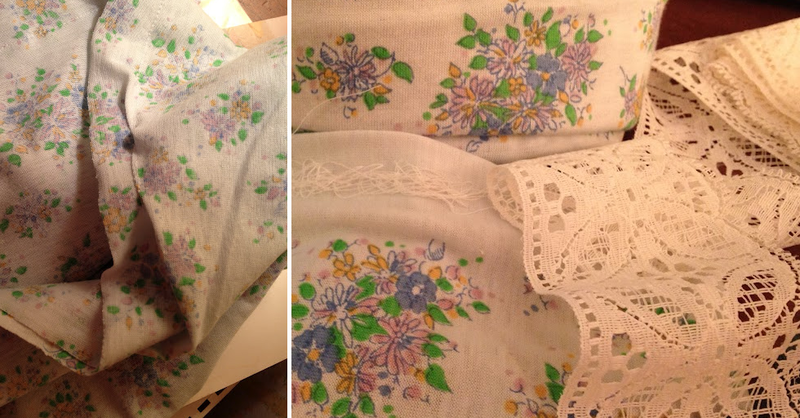 I bought some flowery fabric at Goodwill, and used some lace trim I found lying around the house to use for the ends. I also snagged a simple starter kit from Jo-Anns Fabric Store, which came with some pink sewing stuff. Totes cute! I made a few typical beginner errors, but it's okay, I'll just put the emphasis on "shabby" when I describe this pattern as shabby chic. And there you have it! My first anything! I'm totally proud of it... But I am looking forward to honing my sewing skills and hopefully creating a few tutes of my own to feature here on QuarDecor, or in my QuarDecor Etsy shop. Soon!